HIGHLAND PARK — In honor of National Gun Violence Awareness Day on Saturday, June 2, corporations, mayors, residents and a series of iconic landmarks in all 50 states will participate in the Wear Orange campaign. ● Communities throughout Illinois and beyond will join together to showcase the full creativity of Wear Orange supporters from concerts to picnics in the park to orange walks to meeting at local landmarks as they turn orange. Wear Orange Weekend events are planned to honor of National Gun Violence Awareness in Highland Park, Deerfield and Chicago. Specific event details noted below. WHEN: May 29, 7:30 p.m. WHEN: June 4, 7:30 p.m.
and the hundreds more wounded by gun violence every day – and demands action. Last year more than 500 noteworthy individuals and organizations, including President Obama, Julianne Moore, Kim Kardashian West, Amy Schumer, Vogue, Teen Vogue and Viacom answered the call, making their support for the movement loud and clear. And across the country, nearly 250,000 people took action online and in person at events. This year promises to reach much, much further—the skyline is the limit. Landmarks across the country – in all 50 states – will go orange in support of National Gun Violence Awareness Day. In 2013, a small group of teens at a South Side Chicago high school asked their classmates to honor the life of their murdered friend Hadiya Pendleton by wearing orange – the color hunters wear in the woods to protect themselves and others and a color that reflects the value of human life. They inspired the Wear Orange campaign (wearorange.org ), a coalition of more than 500 non-profits, cultural influencers and elected officials working to reduce gun violence in America. 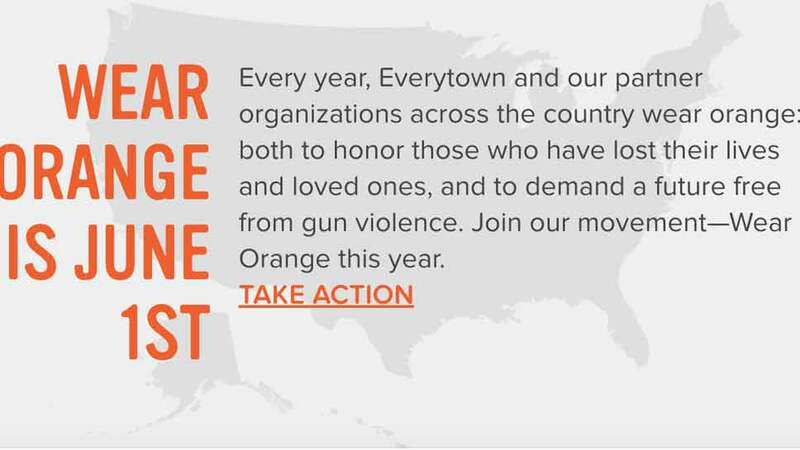 Spearheaded by Everytown for Gun Safety, the campaign asks Americans who believe we can do more to save lives from gun violence to do one simple thing on June 1, National Gun Violence Awareness Day : Wear Orange. Those who wear orange pledge to honor the lives of Americans stolen by gun violence, to help keep firearms out of dangerous hands and to protect our children from gun violence. Orange is the symbol of the gun violence prevention movement, and is used by activists all over the country to raise awareness.